LOS ANGELES (AP) — A Los Angeles teachers’ strike that sent thousands of shouting educators into downtown streets, paralyzing traffic during a rainstorm and leaving a half-million students in uncertainty, isn’t the kind of publicity Mayor Eric Garcetti needed for his potential presidential campaign. The Democratic mayor, who has said he will soon decide whether to enter the 2020 White House contest, would anchor his candidacy to the idea that local government is where things get done in America, in contrast to the turmoil and vast political divide in President Donald Trump’s Washington. But the televised scenes of angry picketers leading chants with bullhorns and blocking streets during rush hour chafes against the notion of LA as a model metropolis and provides a reminder of the challenges that come with trying to mount a national campaign from City Hall, not Capitol Hill or a statehouse. Michael Dukakis rose to prominence in the 1980s on the Massachusetts Miracle economic boom. Ronald Reagan coasted to re-election by telling voters it was “morning again in America.” How Garcetti would sell his record to voters is just starting to emerge. But the labor strife in LA is the latest example of urban headaches that could shadow a campaign that would be inescapably hitched to the city’s rise or fall. The mayor can fairly claim that the local economy is thriving, and Google and Facebook are among the companies expanding here. Once-dreary downtown has seen a rebirth. 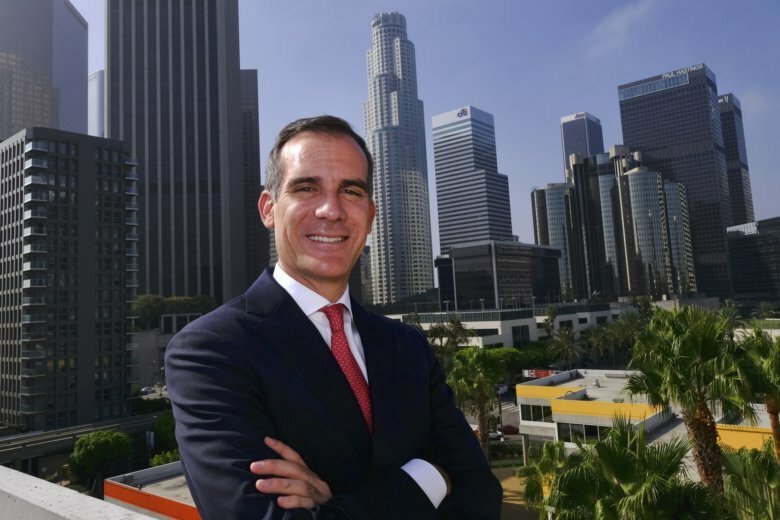 But as a mayor, Garcetti faces numerous hurdles not shared with potential rivals like Massachusetts Sen. Elizabeth Warren or former Vice President Joe Biden, who are fixtures in the Washington establishment. Homeless encampments line downtown streets, even with a strong local economy. A vast transit-building plan has yet to show any sign of easing the city’s notorious traffic, and a federal corruption probe at City Hall is looking into foreign investment and downtown development. Other barriers are historical — no sitting mayor has ever been elected to the White House. Garcetti is in the middle of a second term. Equally ominous: LA’s City Hall has long been a dead end for a string of its former mayors, whose political magic didn’t travel well when they set their sights on higher office. Former Mayor Tom Bradley failed twice to become governor, and his predecessor, Sam Yorty, tanked in races for governor and president. More recently, businessman Richard J. Riordan lost a bid for governor in 2002 and former Mayor Antonio Villaraigosa faltered in his run for governor last year, failing to even win his home county. The record for New York mayors is similarly discouraging. Rudy Giuliani briefly ran for U.S. Senate in 2000 and was an early casualty in the 2008 presidential race. Ed Koch faltered in a bid for New York governor in 1982. John V. Lindsay, a Republican, switched parties in 1971 and sought the Democratic presidential nomination in 1972, but dropped out after a few primaries. He also flopped in a U.S. Senate bid. Why? The nature of local politics is often messy, and mayors typically become targets for all sorts of grumbles that never reach the Washington Beltway — labor strife, trash that doesn’t get picked up, traffic that doesn’t move. Governors and presidents, though, are often layers removed from where policy hits most voters in their daily lives. Senators and representatives, meanwhile, may have to navigate poor ratings for Congress but are always able to point the finger at someone else in Washington. Garcetti’s fellow Californian and another potential presidential contender, Democratic Sen. Kamala Harris, is free to express her sympathies with organized labor — a common maneuver for any Democrat — but has no reason to get directly involved in the strike. Another challenge: Rural voters historically look askance at big coastal cities. Garcetti, rooted in heavily Democratic Los Angeles, could also be a target for Republicans who typically dominate the heartland vote and could depict him as another Hollywood politician looking to export sprawl and liberal values. But he’s far from a national figure, though he has traveled to Iowa, Ohio and other battleground states to raise his profile. He was initially elected on a back-to-basics agenda but has since helped secure funds for rail lines and championed a $1 billion program to get control of the homeless crisis. Other mayors considering White House bids have their own challenges but have more cushion than Garcetti — they are no longer in office. Billionaire Michael Bloomberg is known for his vast business empire, along with his years as New York City mayor. But he’s also a philanthropist who has donated tens of millions of dollars to causes like gun control. Mitch Landrieu, who spent two terms leading New Orleans, gained national attention with his decision as a white mayor of a majority black city to remove high-profile Confederate monuments and arguing that the nation needs a frank discussion on race. And Landrieu agrees with Garcetti that mayors are qualified for the Oval Office. The LA mayor has no authority over the school system — the Board of Education is independently elected — but even Garcetti has said that when you are a mayor, there is nowhere to pass the buck. He’s been deep into talks with union and school leaders, along with Democratic Gov. Gavin Newsom, and trying to encourage a deal as the strike entered its fifth day Friday. But he said earlier this week that he’s not planning any announcement about his political future while the walkout continues. “My first priority is making sure that kids are safe, that are schools are open,” he told KPPC radio. This story has been corrected to reflect that former Los Angeles Mayor Antonio Villaraigosa ran for governor in 2018, not this year.